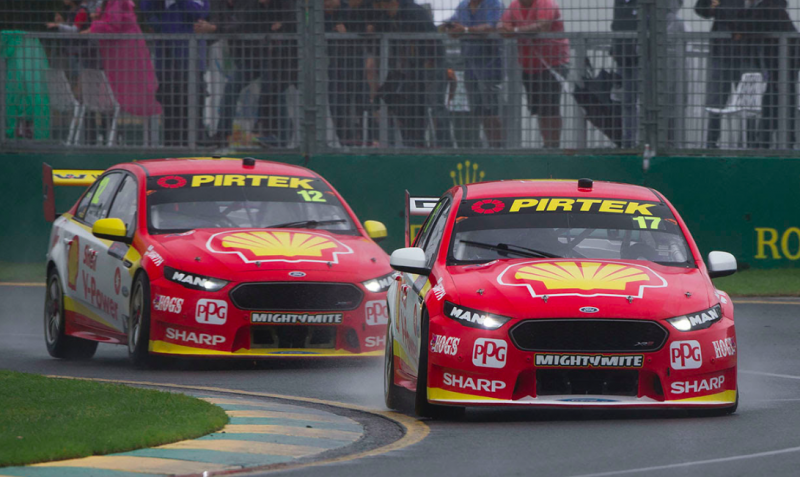 Shell V-Power Racing believes there is still ‘a lot more potential’ to be unearthed from its Ford Falcons as the squad continues the ‘big task’ of catching the Holden teams. The reigning teams’ champions enjoyed a strong showing at the Coates Hire Supercars 400 by racking up their first win of the season alongside a further three visits to the podium. However, Scott McLaughlin’s Race 3 win is the only victory for the Falcon so far this season, while the new ZB Commodore has scored wins in five of the six races, marking the chassis as the current car to beat. The squad maintains it has a ‘big task’ ahead of them to reel in the Holden squads as they continue to learn to extract the best from the latest generation Commodore Supercar. Progress is being made by Blue Oval teams to close the gap after both Shell V-Power Racing and Tickford Racing ran new bonnet and roof panels at Albert Park to combat the affects of the new composite panel shod Holden. DJR Team Penske managing director Ryan Story says his team is up for the fight and will continue to work hard to unlock more speed from the Falcon package. “There is a lot more potential to make the car more competitive,” Story told Speedcafe.com. “At the end of the day it is not a question of what we can do, it is what precedents have been set and that is an important distinction to make. “I think everything we do helps, we just need to keep fighting and pressing ahead. “In terms of trying to embrace it (the gap to Holden) during the season, it is massive. “It is a big task but we are up for the fight and we are looking forward to it. “We are still pressing on and working very hard and the nature of calendar for the next few events puts enormous pressure on us Queensland teams because we have such limited time in our respective workshops. “We can’t ease up. The competition is just way too strong. The Coates Hire Supercars Melbourne 400 also saw Fabian Coulthard return to form in the sister #12 Falcon after a difficult Adelaide 500 opener. Coulthard headed to Albert Park lying 20th in the standings but was able to bounce back find a to results of third, third 12th and sixth after finding a much more comfortable set-up on his car. Given the level of competition has gone up another level this season, Story says it is critical that both his drivers are fighting at the sharp end this year. “It was all about getting his (Fabian’s) confidence back up and getting that side of the garage working a bit better,” Story added. “They had a solid weekend from where they came from at Adelaide and it is just the start of something. If you give these guys the cars to do job they will get it done. “You can’t have that success in either drivers and team land without having all of your cars at the pointy end. It is not something you can take for granted either. “We saw it work in our favour last year by winning the teams’ championship and that is something we are immensely proud of. The Supercars Championship heads to Symmons Plains, Tasmania for the Round 3 from April 6-8. Shell V-Power Racing has elected not to return its cars to its Queensland base having opted to prepare the cars at Penske Power Systems workshop in Melbourne.